It was a very busy week with 5 visitors. One coming from The Netherlands (Joop) and four from France from the association A Petits Pas (Didier, Marie Paule, Christophe and Sonia). A Petits Pas is a French association who has been supporting projects in 4 of our villages since 12 years. 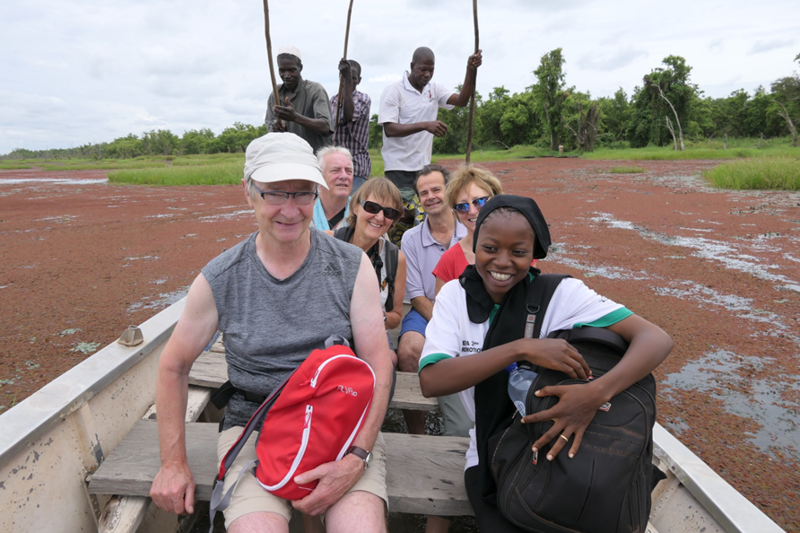 Each year member of their board makes one or two trips per year to Burkina to visit their villages and discuss with our local staff. We first went to visit two farms we have in the villages of Sokourani and Mogobasso. On the way, we passed by the “marre aux Hippopotames”. On the water. Zalissa (manager for the farms) had never been on a boat before, so she was not very comfortable. At the moment, we have 5 nursery schools. We went to visit 3 of them. Children are 5 years old when they start the school. The school has one director, 2 support persons, one cook and one guard. It is administrated by a mother association. The school is for one year and then the children are going to the primary school. Costs for one child per year is 80 euro. Awkward moment in Nefrelaye. I was filming some of the kids. One boy came behind me and was watching his friends on my screen. He was very happy and called the children I was filing to come see. They came and then there was nobody on the screen. The boy did not understand what happened…. Students had prepared a show for the end of the school year, sketches, dances…. Above, our French visitors. Students are studying agronomy and husbandry for the first 3 years of the school. This year we had the students of the third year pass an exam on those subjects. It is an in- house exam and is not recognized by the ministry of education. It still gives the students a certificate on what they have learned if they pass this exam. Macaire the study director, giving her certificate to a student. In addition, students who passed the exam got a chicken from the LAP chicken coop to take home. Parents loading the luggage on their motorbikes. Les meilleurs mots du monde ne sont que des sons vains si vous ne les comprenez pas. Hope you will have a very good week.